Re: PAN online poll, Dec. 11-17; White Rock towers backed after 5-hour hearing, Dec. 9. Re: PAN online poll, Dec. 11-17. I think you may need to update your poll site to ask for a White Rock address if you are asking a question concerning White Rock taxpayers. After attending the public hearing on the Oxford towers (White Rock towers backed after 5-hour hearing, Dec. 9), I was appalled at those outside of White Rock trying – and succeeding – to influence our politicians. This can also happen with your current poll question – “Do you like the idea of more highrises in White Rock?” – and will only make the developers so happy as more and more high density proposals are to come forward. So sad that we have to think like this now. Re: White Rock towers backed after 5-hour hearing, Dec. 9. I spoke at the public hearing regarding the development proposal by Elegant for two twin towers across the street from me at 1454 Oxford St. While I opposed this development for many valid reasons, I do have to applaud Mayor Wayne Baldwin and Couns. Lynne Sinclair, Bill Lawrence, Grant Meyer and Megan Knight for their consistent transparency – as we citizens have consistently seen through them for a disturbingly long time. I used to feel so proud to call this town my home. After coming from Surrey, I appreciated the small town feel; it felt like a Cheers bar, where everybody knows your name. I promoted the businesses in White Rock; I pushed for revitalization and beautification of our town centre. I believed growth in the town centre, which would include highrises, would increase densification in the right area – therefore, creating a walkable, eco-friendly, sustainable, healthy commercial area that would benefit all of the citizens of White Rock. I was familiar with our Official Community Plan and assumed my mayor and council shared this vision. I knew we would not always agree on every development proposal, but I thought we would at least have two-sided dialogue as we had in the past. 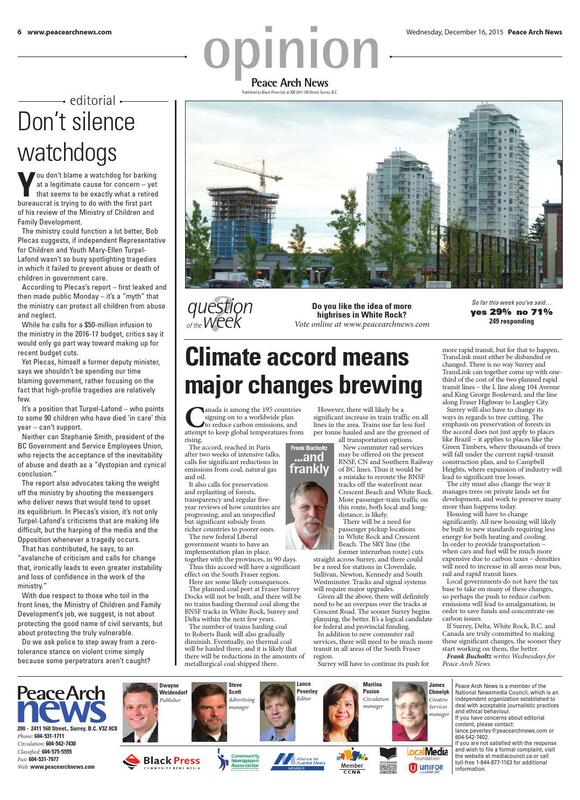 This last year, I have seen the end of citizens’ question period, unprecedented conspicuously timed confidentiality agreements for the public acquisition of our water, numerous in-camera meetings, censure of a councillor with an opposing view, huge financial campaign contributions to White Rock Coalition members… and the list goes on and on and on. The developer of the Oxford proposal once told me at an information meeting that his development would benefit me financially, because in three years the whole hillside would be full of highrises. After Monday’s meeting, I have no doubt that his vision will come true.